Hey Junkie Fans, here is my first post to the blog. 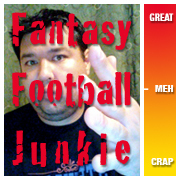 Sure to become a must visit site for all fantasy football partakers. I will surely have much more in-depth posts in the future but wanted to get something down quick to get started. My advice, go get Mike Wallace if possible. I know he just had a monster game,but if you can finagle a trade for him without giving away the moon I would do it. My thoughts are, as Charlie Batch showed, with time, Wallace has much more value given time to stretch the field. And with Rothlisberger coming back in a couple weeks, he quickly gives the Steelers a QB who can buy time in the pocket. He’s known for toughness and ability to scramble and avoid pressure. So when he gets back, Wallace owners probably wont be willing to part with him. Mr. Junkie can you help me with some advise? Who do I start Schaub, Cutler, or Eli Manning? I also have Boldin, Murphy, as Wrs, and Mcfadden,L Mccoy as Rbs, who should be my flex Jacoby Jones, R.Rice,M.Lynch,L.Evans? I really think Rice has a tough week against the Steelers and hurt. Plus J Jones could be score big if Johnson is out or playing hurt. The Raiders def might be keying in on Walter instead of Jones. Hey couchpotatoe, that’s a pretty good lineup you got. It’s interesting that you might want to start Jacoby Jones and sit Schaub. It is always a tough decision to sit a top 5 QB. As good as Schaub will be for the year, I would play Cutler this week. Just hearing the news that DE Mathias K is out indefinitely is a big blow to their DEF. For the flex spot, I would role with Rice if he plays. Might be something you have to watch for on Sunday. If you are unable to monitor on Sunday morning, Jones is the next best bet. Thanks for having the first comment on the blog! you’re advice was good. Cutler seemed like a logical choice, but he must have gotten seriously drunk last night or stoned because he just seemed to rather get a beatdown then get rid of that ball more quickly, bears woulda been better off just running the ball with Hester in the wildcat. Man Mike Simms Walker has gotten little love this season so far. I think I’m going to cash him in for Mike Thomas of the jags. I just want second opinion before I do because normally Mike-Simms is not a WR someone just drops…What do you think man? I’m with you. I don’t like to sit my stud players for almost anything. They are studs for a reason in my book and usually find a way to make points. I couldn’t in good conscience sit All Day. LOL, I know. Excuses aren’t good but I gotem. Just did the players to start on paper last night! Hopefully getting the video up in a bit. Thanks for the push. good picks….agreed with mason…after your spot on defensive pick of the Rams last week who can argue about the Lions? I think they will play with a ton of passion and bradford isnt no phillips rivers yet (whom i cant stand)..lol Fred Jackson is better than a lot of RBs especially considering what he did last year for the Bills. Someone in my league actually dropped him and i picked him up off of waivers. I honestly do not understand what the Bills are thinking sometimes but I also nabbed marshawn lynch in a few leagues as well. This year im stocked up on starting RBs and in each league im planning on using one of them for trade bait to upgrade at WR. Hey Frog! Good thing I checked before running out to do some errands before kickoff. I am enamored with McCluster, and have never been much of a Spiller guy yet. Both could go off but I like Dexter’s chances against a porous Indy D.
thanks man I appreciate it..good luck on your teams this weekend!! out of these three recievers which one would you rather have? If it’s a PPR league Amendola is my pick, but for a standard league I might take a stab at Tate. Who knows what you will get out of him. But if you need immediate production I still think it’s Amendola. Especially with Clayton out for the season now, Danny will get more looks and Bradford really trusts him. those are my thoughts too..i like Williams and Tate but Bradford has shown that he’s rather co-dependent on certain receivers..thanks man.